I have to admit Kenny is the cobbler maker in the family. Every since he purchased his Indiana Conservation Officers Cooking T.I.P.S in 1992, he is the only one who makes cobbler. It is so good that the entire family request his desserts. It doesn’t matter what kind he makes, there is never any left-overs. This is one of our favorites so I wanted to share it with you; it’s so easy you could make it every evening for your family. Most any fruit can be substituted for your recipe. Preheat oven to 350 degrees, In a large bowl, combine all ingredients except fruit. Pour into an 8 x 11 inch oven-proof shallow dish. 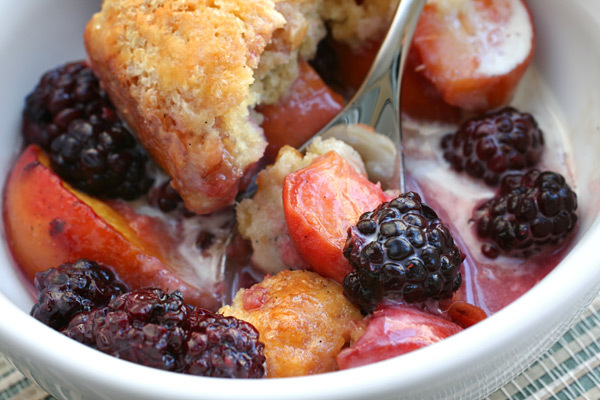 Top with fruit and bake for 35 minutes or until golden brown (cobbler will still be slightly runny). Let set 15 minutes and serve warm. The original recipe was contributed by Dwane Ford, Conservation Officer, Jay County. We appreciate him sharing this recipe, and I’ve always heard after you make a recipe three times, you can claim it as your own. I’m not sure that is true but Kenny claims it now since he has made it some 100 times by now. I hope you enjoy this as much as our family does.